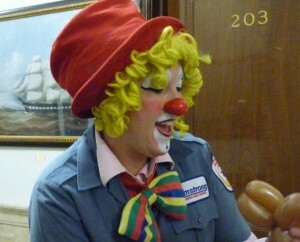 Armstrong got into some “funny business” at Medford’s Holiday Celebration. Medford City Hall was turned into a Winter Wonderland filled with Santa, face painting, hay rides and the annual holiday tree display. Patches the Armstrong Clown made balloon animals for both young and old as they watched the lighting of the Christmas tree, Hanukkah menorah and Kwanzaa Kinara. What a fun night ‘clowning around” with our friends from Medford as we kicked off the Holiday season!